In an unsurprising (to me) turn of events, I’m not reading as much these days. I’m in my third trimester, and everything, including reading, takes more effort. Any moment when I’m not building block towers, at the museum, supervising crayon time or cooking meals, I try to sleep. My girl is growing fast, making her momma (more) ungainly in the process. I love drinking tea. It makes cold nights more comfortable and grading papers manageable. I found this book on a discount rack and decided that it fit in well with my desire for tea, history and cheap books. Alan Macfarlane is an anthropologist and his mother Iris is a retired tea plantation manager’s wife, which gives them unique perspectives on the topic. Their story of tea blends together science, history and anthropology while focusing mainly on the Assam region of India. I like reading about the British Raj, but I do wish they would have spent more pages talking about the role of tea in other parts of Asia. I’m rounding out the year with another book from work. As a general rule, I do not seek out political history books because I find them dull. However, another of my general operating procedures is to read as much as possible about the period I am researching. This book deals with the years 1948-1968, which falls squarely within the scope of the exhibits I am writing. Dowdy compiled good information that adds complexity to my understanding of the city during these decades. Frankly, reading this book makes Memphis’ current political climate seem downright tame. Fantastically good writing. Honestly, when I read the blurb on the back of the book I wondered how anyone could write a novel based on a man walking between the World Trade Centers on a tightrope. The plot was not what I was expecting, but it was expertly executed. This architecture book was one I read for work. Part of the big idea of the new exhibits I am working on is that the use of the mansion building has evolved over time to fit the needs of its users. My research is leading me to the conclusion that this is true both architecturally and philosophically. Brand made me think about buildings in a whole new way, which had the added benefit of making me love my old house even more. As a general rule, I will read any book that promises humorous essays about the region that I love. Some of Reed’s essays fit the bill and others were not quite my style. It was also odd to read stories written about New Orleans pre-Katrina. I have gotten so used to post-Katrina NOLA discussions, that it was hard to get into a pre-flood mindset. As with the other Rainbow Rowell books I have read recently, this one made me happy. It’s a fast book, and a reminder to not take people we love for granted. I won a copy of this book from The Penny Hoarder, which I was super pumped about. While I already do a lot of the things that Gunders suggests in her handbook–like utilizing the freezer, canning, composting, and making stock from food scraps, I found some good information. For example, her explanation of food expiration and best by dates made me rethink my approach to some of my kitchen staples. I also appreciated the reminder to think about food as precious and something that should be used to its fullest capacity. It’s easy to forget that mindset when living in the land of 24-hour grocery stores. We have a food-secure household, and for that I am very grateful. Background research for a project at the museum. We recently reframed the concept of a gallery that we are redesigning to include a panel about the suffrage movement in Memphis. Wedell’s book does not deal exclusively with the suffrage movement, and it comes before the time period the exhibit will cover; however, I believe in casting a wide net. She gave me background information about the women who were active in the community in a well-researched format. Tana French is the reason why I do not read other mystery novels. She sets the bar so high that I have a difficult time finding other authors who can entertain me as well as she does. This is the fourth book of hers that I have read, and, like the others, she kept me guessing and twisting with the lead detective until the end. If you like psychological mysteries, you should definitely give her a read. I love October. It’s the perfect month for getting cozy under a blanket with a book while drinking a hot mug of tea. Heavenly, actually. Specials is the third book in Westerfeld’s Uglies series. My best friends and I have a thing for young adult dystopian literature, and we pass series among ourselves as we discover them. It’s our thing, and the fact that we are squarely in the realm of “adults” now does little to dissuade us. I enjoyed reading the rest of Tally’s story, and I’m sure I’ll enjoy the fourth book just as much. And here we have another book that I read at the museum. One of the gallery redesigns that I am working on is about Memphis street life from 1915-1930. The background for this period is squarely found in the Memphis race riots of May 1866 and the Radical Reconstruction decade that followed (as well as the yellow fever epidemic). I knew the riots happened and that they were important in the city’s history, but I didn’t realize how much the issue of whiteness–who was and wasn’t white–came into play. Several members of the mob who attacked the black population were Irish, and Ash does an excellent job teasing out why that matters. If you like local history or are interested in Reconstruction, this book is an excellent addition to the historiography. I received this children’s book through the LibraryThing Early Reviewer program. Mansbach writes what many parents find themselves saying on a daily basis. The humorous take on a regular frustration was welcome, and my toddler enjoyed hearing the book read. Some of the rhymes are forced, but I enjoyed the spirit of the book nonetheless. I found this short collection of essays in my neighborhood Little Free Library. The one I liked the most was about “compulsive proofreading,” which I am guilty of doing. It’s partially an occupational hazard and mostly because I like catching written mistakes. Her reflections on books and reading also reminded me of the importance of being unashamed of your literary choices. Eclectic reading habits make for interesting readers. Another read for the museum. I’m working on panels about the mansion’s architecture and found myself in need of a very short primer. John Irving is an interesting writer. I always know that a twist is coming, but his genius lies in not letting you know when it is going to happen or how completely you will have been misled. Rowell is the author I am most excited to have found this year. Her stories are fun and well written without trying to hard. This book was about wizards and gave me some Hogwarts nostalgia while being completely its own universe and story. What’s not to like? We somewhat jokingly have “Theory Thursday” in my department when my boss and I have our philosophical discussions about museum theory. I also try to read a couple of museum books a year both to stay current in my field and also to pull new ideas into my Introduction to Museum Studies class. I had a hard time getting interested in Bedford’s book, but the last chapter made the philosophical underpinnings of the other chapters worthwhile. Basically she suggests that exhibitions are both education and art, and visitors will re-imagine the story line in a way that resonates with them. Therefore, using exhibitions as aesthetic experiences is not about being didactic, it is about facilitating. This behemoth of a novel is about the long tradition of English magic, the Napoleonic Wars, personality clashes and a really misguided and vindictive fairy. It took me about a hundred pages to get into the story because Clarke had to lay a lot of groundwork for her alternative history/fantasy to work. Once I made it that far in, though, I was thoroughly hooked. I highly recommend this novel to anyone who is a fan of thoughtful fantasy. Dr. Sherman’s work on Phoebe Omlie, an aviation pioneer and adoptive Memphian, is astounding. In her afterword, Dr. Sherman lays out just how much investigative research went into piecing together Phoebe’s remarkable life. I would guess that almost everyone knows about Amelia Earhart while very few remember her contemporary female fliers. I happened upon a newspaper article from 1936 that said Phoebe helped organize an exhibit at the Pink Palace about herself and her late husband Vernon, which is what got me down the path of learning more about her and figuring out how we can include part of her story in our new exhibits. This book is a well-researched biography that places Phoebe Omlie and the history of female aviators in a national context. Pretties is the sequel to Uglies, the YA dystopian novel I read last month. It was an equally entertaining and fast read. Rainbow Rowell has the wonderful ability to capture what a period of growing up feels like in a way that makes me remember being there myself. I am a giant nerd who found my people, and I know the relief that comes from knowing that you can be exactly who you are and be loved for that. This novel is a quick read that made me momentarily nostalgic for Harry Potter book release parties. This month I went for the horrific and depressing. It was one of those accidental reading mash-ups that happen from time to time. Two summers ago I found myself reading book after book set in WWII England. This June it was colonial Australian history and one of the worst hurricanes in modern America. Next summer we are hosting an exhibit called Nature Unleashed from The Field Museum. For pre-exhibit research I decided to read about the 1900 Galveston, Texas, hurricane (to go along with last month’s book on Mississippi River flooding). This book was published in 1999, well before Hurricane Katrina hit New Orleans, but my brief internet searching says that the 1900 Galveston storm was more deadly. What I liked most about Larson’s book is that he combined the science of storms with an explanation of the historical mindset of turn-of-the-century America. He managed to capture the technological hubris of the day, which is shockingly similar to the present. Larson also told a few individual stories out of the thousands. It combined to make a thoroughly interesting, albeit sad, read. I read two books this month. Part of the reason is because this bestseller from 1988 is 600 pages long. That’s right, a 600 page history bestseller. That alone was enough to pique my interest. Also, my historical understanding of Oceania is lacking in the sense that it is nonexistent. I never had a class on the area. In fact, the closest I got geographically was one on British India, which shared a few colonial similarities. Bill Bryson introduced me to contemporary Australia, but I wanted to learn more. Hughes covers this immense topic with engaging prose. He talks about class divisions in England, a survey of British crime, penal theory, the practicalities of setting up a colony on an unexplored continent, the assignment system, aboriginal culture, secondary punishment sites, and the mass brutality on Norfolk Island. However, in the midst of punishment, there was also opportunity. Hughes stressed that not all masters were sadists and that conditionally pardoned prisoners often had better economic prospects than their counterparts in England. What a world. I think it’s time to read some fiction. I’ve been asked if I actually enjoy reading or if I just consume books. Frankly, I love everything about reading–the initial promise of the cover, the feeling of being wrapped in another person’s philosophy and emotions, the satisfaction of learning where these characters are going, and closing the book with the knowledge that it’s there if I ever want it again. I also go through phases with my reading. Sometimes I intersperse nonfiction and novels, other times I lean heavily to one side and abandon the other. On occasion, I will read one book at a time, but I usually have more than one going. Often I have a research book underway at work, a novel that I left in the nursery, another book that I started so that I could have something to read and not wake up the toddler, and then one that I just got off of the library’s wait list on my Kindle. I also read very, very fast. Usually, I don’t skim or speed read, but I left graduate school with an incredibly fast reading pace. I had to unlearn how to “gut” books (read for the thesis and major supporting arguments and skim the examples), but I was ultimately left with the ability to read faster and deeper. Valuable skills, I can assure you. I got poison ivy on my face this month, so I had a few days of binge reading while I tried desperately not to scratch my face. The steroid fueled read-a-thon also coincided with bad weather, which created a perfect storm of word absorbing. Frankly, not as good as Bossypants by Tina Fey, but it was still a fun read. Poehler’s all over the place, but there are some great quotes that I had to highlight, among them, “I love my boys so much I fear my heart will explode. I wonder if this love will crack open my chest and split me in half. It is scary, this love.” Also, “A story carves deep grooves into our brains each time we tell it. But we aren’t one story. We can change our stories. We can write our own.” I can empathize. I really enjoyed this novel set between the 1927 Mississippi River flood and the early 1940s. Cheng’s sentences are beautiful, and his story invokes a world that is at once distant and yet relatable through characters’ emotions. He also handles ingrained racism deftly. I will definitely pick up Cheng’s next novel, which I hope is not too long in coming. What I like best about Crosby’s writing is the way she is able to make well researched facts read like the twists of a detective novel. She gives a glimpse of what 1913 London was like on the eve of World War I and tells a good story at the same time. Little Free Library win! My LibraryThing secret santa sent me this novel in December. Since I had been hoping to read it ever since my coworkers gave it glowing reviews, I was pleasantly surprised to be gifted it. I loved it. Read it. You’ll be happy. I once again struck gold in the Pink Palace’s Little Free Library. This one was armchair travel at its finest; Bill Bryson combines tourist traps, history, trivia and endless amounts of driving into something more than I thought possible. There’s a reason people pay him money to go far away and write about it. This book takes on North Korea as a setting with complicated results. Sad, but with staying power. The Reading Chair. A Delayed Gratification Story. Part I. We recently moved a bookcase, which freed up some space in our living room. Upon taking a step back, we realized it would make a lovely spot for a lamp and a reading chair, largely due to the inability to see the TV from that location. The thing is, we have many projects (big and small) that we want to undertake this year, which means there’s no budget for a comfy chair. 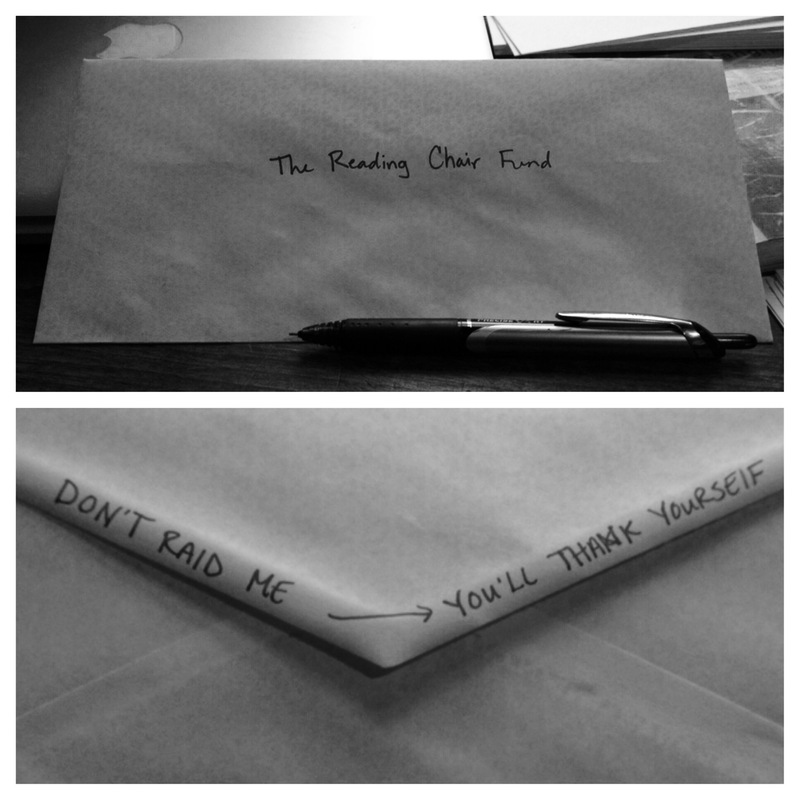 Enter the reading chair fund. We are savers by nature, and we decided that we can reasonably take some small cash denomination out of each paycheck and wait a year. The idea is that next January, we will have enough cash on hand to buy our chair. It is a way for us to separate out some money to do something small that we simply want. Sometimes I need to be reminded that money is not an enemy, and this envelope of delayed gratification will help.